DETROIT, MI, July 25, 2018 — Hillary, Obama, and Trump supporters, who were beta readers, cheered the book's release, seeing it as an excellent toolkit to empower their political bases. Trump backers think that Haat Intelligence is a symbolic reference to the deep state and that they were able to map the novel's fictional characters to well-known people. They believe that the book is a perfect gift for Trump in a right moment, and by juxtaposing global problems of the two worlds, the novel hits the nail on the head. Obama and Hillary's supporters think that the president unknown to the author might be Trump because they believe that Haat Intelligence is the KGB, and the kingdom of Haat is the Soviet Union. Norman Baltson was born in the USSR. His father was jailed for his anti-Soviet activities. At the age of five, while his father was in prison, he witnessed his mother's death. During his years in the high school, he began interacting with the invisible universe, believing that he had a special gift from God and that the parallel world was real. Later, for his communication with angels, terrorists wanted to kill him. Then, he escaped to Canada where the angels—on God's behalf and to save humanity from dangerous traps of another universe—narrated to him seven volumes of stories. Among all these, Canadian doctors diagnosed him with schizophrenia, but years of medications didn't make the parallel universe disappear for him. He still believes that the world is under constant threat from the other dimension and wants to counter the menace through education. 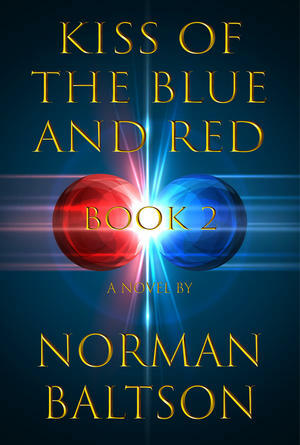 The eBook, “Kiss of the Blue and red,” priced $9.99 (three-day-30% off where available), distributed by Google, Kobo, Barnes & Noble, Apple, and Amazon or at http://normanbaltson.com. The printed versions are scheduled to release in August.